There are times when, for a number of road users, driving can be a daunting experience. Fear of motorways is one example, according to the AA, with roundabouts being another potential area for confusion and worry for drivers. There are different types of roundabouts throughout the country and some are more worrying for road users than others. Larger roundabouts can have several lanes approaching them and going around them, with traffic lights and signs also included. With these different actions happening at one time and all requiring attention, it can be stressful for a driver to try and action what they should be doing, safely. 2pass.co.uk advise that when you approach a roundabout you need to make sure that you notice and act on all of the information available to you, including traffic signs, traffic lights and lane markings which direct you into the correct lane. We have put together some tips for roundabout safety, to try and help to make it clearer and easier for you next time you get behind the wheel. According to Road Driver many drivers do not understand roundabouts, and therefore they can become a little tense when dealing with one. Firstly when approaching a roundabout, Driving School Beckenham recommend you to get into position early, through using the mirror, signal, manoeuvre method, while looking out for road signs before you reach the roundabout. These will tell you which exit you need to take and may also tell you which lane to get in, if it is a big roundabout with traffic lights. 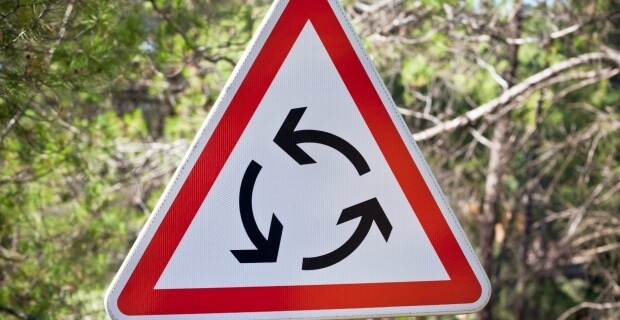 Driving Test Tips suggest approaching a roundabout in a similar way to that of a normal junction. The earlier you know that a roundabout is approaching, whether through spotting signs or noticing traffic crossing in front of you, the more time you will have to prepare and act safely. When waiting at a roundabout you should give right of way to the traffic already going around it, from your right. This is unless the roundabout is managed by traffic lights, then these take precedence. When you are at the junction of the roundabout there are many pieces of information to take on board to calculate the right decision. You need to work out what cars are going where, their speed, and when is the best time to leave the junction and go round the roundabout. If one of these key pieces of information is misjudged then there can be severe consequences. Thankfully though, these accidents happen rarely, and roundabouts are actually safer to negotiate than a normal junction according to Auto Blog. An easy tip to remember is to look at a roundabout as if it is a clock. Road Driver suggest if you are going straight ahead at ‘twelve o’clock’ or turning before that junction, then you should get into the left hand lane. If you are turning past the ‘twelve o’clock‘ junction (going right or full circle), then you should get into the right hand lane. When joining and driving around a roundabout, Driving School Beckenham tell you to always keep an eye out for other road users such as cyclists, horse riders, motorcyclists and pedestrians crossing at the junctions to roundabouts. They can be slower at using the roundabout and therefore need extra space and time allowance. The worst action you can do at any point of driving, especially at roundabouts, is to hesitate. If you are not one hundred percent if you are good to go, then don’t. Only go when you are sure you can, when it is safe to do so.